In a 4th Wall breaking scene, Tama complains about her grandmothers revealing all her embarrassing secrets to her friends. It's Summer Vacation and Tama is happy that the first thing she and her friends have planned together is the Summer Festival. But first, wake up by eating some pickled plums! Tama can't contain her excitement about going to the festival. Kamuri shows her excitement by chanting all the foods she's going to eat. She started with takoyaki. Shion and Hiroe went to the same festival and somehow didn't run into the girls. They were busy doing their own things, of course. Enami-Sensei shows Eiko that she is still not a match for her implied yuri ways. She'll bite your ice cream and lick your finger and show no remorse! 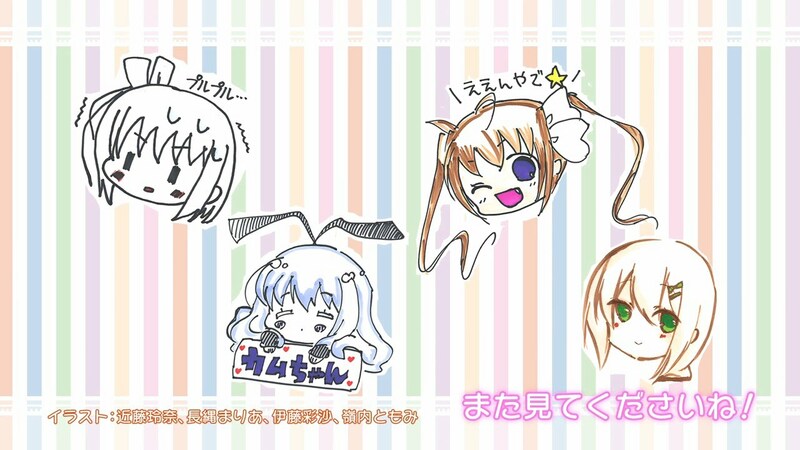 I couldn't even tell you what's going on in the end card, except 4 different artists doodled something about the main characters. Hana is still concerned about going to the pool, I assume.